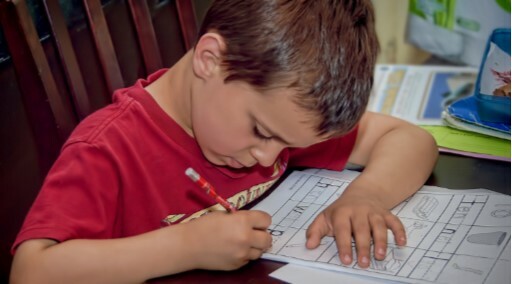 Children learn in a variety of ways.Parents and teachers can help them learn by varying our schedule and activities so they have a chance for some guided learning, some self-directed learning and some down time to process it all. 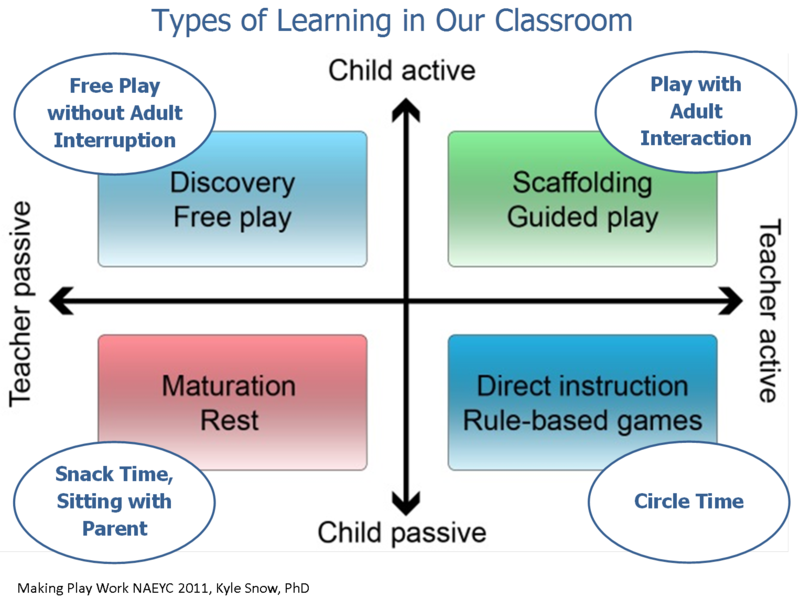 In this diagram by Kyle Snow, he divides four types of learning up by whether the teacher and child are active or passive. (His diagram shows the rectangles of types of learning – I have added the circles.) Whatever classes or daycare your child attends, it’s worth thinking about whether there are opportunities for all four types of learning. Here’s how we use the four types of learning in my toddler classes with Bellevue College Parent Education. Direct instruction is what we think of when we say “Teaching.” This is an adult telling information to a child, or doing an instructive demonstration of how to do something. Direct instruction from a parent or a teacher is a good way to convey core information and build “crystallized intelligence” – the database of information we carry around. The best way to build “fluid intelligence” – the kind that helps us adapt to new situations and learn new skills, is hands-on play and interaction with real world experiences. During class, we do have a book corner where parent and child can snuggle and read for a while. Children are also welcome to come sit with their parents during our parent ed sessions. Snack time also serves as down time for many kids. Think about your family schedule for a moment. Do you have times when you’re teaching your child? Times when they are playing with you nearby, giving occasional suggestions or playing along? Times when they’re playing independently? Quiet time? A nice mix of these will help them learn and grow. This entry was posted in Early Learning / Preschool and tagged Learning, play-based, preschool, teaching, toddler on September 25, 2014 by Janelle Durham. The teacher or parent sets the stage with engaging and fun activities. Then the child explores through play: observing, experiencing, wondering, exploring, and discovering. The teacher or parent is nearby to observe, ask questions, make suggestions, or play along with the child. But the child decides which activities to do, which toys to play with, what to do with them, and for how long. Child-Led. Freely chosen. The child is in control. He makes the plan. Process, Not Product. Play is done for its own sake, not to accomplish a task. It involves lots of exploring of possibilities, experiments, trial and error, and repetition. Creative. The child can adapt items, create something new or experience things in a new way. Spontaneous. It’s flexible and open-ended, and it changes and evolves as play time goes on. Fun. The player looks happy and engaged. Does a child really learn by “just playing”? Direct instruction from a parent or teacher can be a great way of adding information to the database of crystallized intelligence. But, the best possible way for children to build fluid intelligence is by hands-on, engaged, self-guided improvisation… in other words, by playing. Specialized toys. Despite what marketers tell you, learning does not require scientifically designed educational toys and apps or flash cards. Simple, open-ended toys will do. Uninvolved babysitters. Some schools have co-opted the phrase “play-based learning” as a justification for sitting back and letting kids do whatever they want to do with no forethought by the teachers, and no input along the way. We’re talking about a more engaged process. Physical competence. Free play allows a child to practice emerging skills till they are mastered. Self-direction. The child gets to make decisions, make plans, and see them through. Creativity. Experiments show that children who are taught “the right way” to use a toy will use it in limited ways. Kids who are allowed to freely explore develop many more creative uses. Problem-solving. When a child creates her own plan for play, she doesn’t foresee challenges that will come up that an adult might see. This offers lots of chances for problem-solving. Language skills. Play requires asking and answering questions, giving commands and acting on them, and explaining your goals to the person you are playing with. Conflict resolution skills. There’s lots of negotiation that goes on in cooperative play. Emotional intelligence. Dramatic play helps children understand emotions, learn how to express emotions, and distinguish between real emotions and “pretend” emotions. Symbolic play. If a child can use a stick to simulate an ice cream cone, it helps her later understand that numbers on a page represent how many objects they have, and that letters represent sounds, and musical notes on a page indicate where to place her fingers. Better memory. Kids are motivated to remember things they need to know for a play scenario. Reduced stress. Play is fun. Children play when they feel safe. We are all more capable of learning new things when we are having fun and feeling safe. The adult plans an environment and schedule which promotes learning. Children learn best when they feel safe, so familiar routines, consistent rules, and respectful caregivers are essential components. The adults offer meaningful experiences that are stimulating, invite exploration and engage kids. The teacher often has outcomes in mind: knowledge, skills, abilities and understandings children will acquire. But they have not determined an exact path the child must take to get that knowledge. Stage manager: Sets the stage. Creates an “invitation to play” that combines familiar objects and activities (for repetition/mastery) with novel objects to explore and discover. Observer. Observe quietly. Be there so if they look up with an “a-ha” moment, or an “I did it”, you’re there to reflect that success back to them. A good rule of thumb is to observe for at least 3 minutes before talking. Then make suggestions or ask questions to extend their thinking, or encourage reflection. But don’t change their play, or tell them what their results need to be. Recorder: Ask them to describe what they are doing. (Remember, ask about the process, not the product they’ll end up with.) Write it down to share with a parent or friend later. Facilitator: Help get them the tools they need to accomplish their play plan. Help clear away the “clutter” that gets in the way of their play. Ask more, answer less. Mediator: For children age 3 and up, it’s best to sit back and let kids work out their own conflicts and learn from doing so. But sometimes, especially with younger children, an adult helps resolved conflicts by offering new materials or suggesting alternatives, and modelling flexible thinking needed for peer interactions. Interpreter: help children understand what is meant by another’s words and actions. Tools of the Mind style. Kids develop a plan for their pretend play. Teacher offers instruction in pretend play – suggestions specific to the scenario. Kids play. When play comes to an end, the teacher discusses it with them and asks about what they did. Reggio Emilia – inquiry-based or project-based learning style. 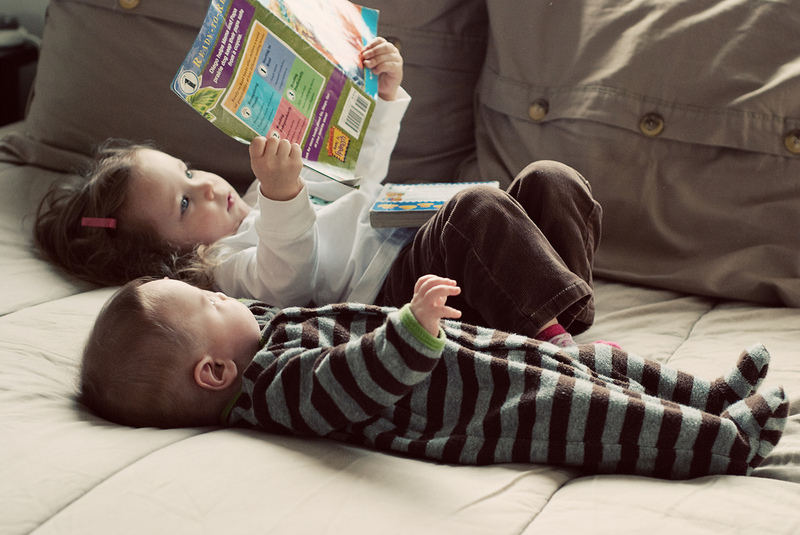 When your child demonstrates interest in a topic, you collect resources related to it: books, videos, tools, resources for dramatic play related to it. The child chooses a project and must plan their actions, gather information, and develop new ideas. The teacher / parent observes, participates, guides the play when needed, asks questions, and encourages deeper thinking. A key element of play-based learning is Scaffolding. Development advances and learning occurs when children are challenged to do something just one step beyond their current mastery, and then allowed to practice newly acquired skills. Adults and older children help them make the step by giving a hint, modelling the skill, or adapting materials or activities, and then allowing them to continue to play. Read: Brain Rules for Babies, by John Medina. This entry was posted in Child Development, Parenting Skills and tagged brain development, Learning, Parent, play-based, preschool, teacher, toddler on September 24, 2014 by Janelle Durham.